A government that seemed in its first term to be self-consciously pragmatic has revealed itself in its second term to be much more ideologically driven. An increasingly obvious sign of that tougher approach has been the government’s apparent conviction that most issues are best entrusted to market forces. The evidence for this is now coming thick and fast. We have seen it in the contract with a private firm to build and run a major prison in Auckland, and in the appointment of a businessman to ensure that the Ministry of Foreign Affairs and Trade either replaces diplomats with businessmen or compels them to behave like businessmen. We have seen it, too, in the sharply increased use of private consultants and contractors for work hitherto undertaken by the public service. The motivation here has been not so much to save money, since private consultants are – as the record annual expenditure of $189 million shows – an expensive option; rather, the government believes that it is worth spending extra money because the private sector will inevitably deliver better results. That belief rests more on ideological preference than hard facts; the proponents of the view that market provision is always best do not always bother too much with looking at the evidence. A recent example is the recommendation from the chair of Auckland Council’s business advisory panel, Cameron Brewer, that future motorways should be funded from tolls on existing roads – an idea, it seems, plucked straight from the pages of a beginner’s manual of improbable “free-market” solutions. But perhaps the most startling example of the government’s keenness to use private business to pursue its objectives in every aspect of our national life is the decision to contract private firms to build, own and run publicly funded schools for our children. We are not permitted to know the financial details of that arrangement. The only thing we do know is that it is part of the price that Act demanded in return for supporting National in government. Act was able to “demand” such a price of course only because National arranged it that way, so we must suppose that the initiative is one that National wants to take anyway. But there are other and more substantial reasons for looking askance at the so-called “charter” schools. The “charter” school is, like the privately run prison, an example of a public/private partnership or PPP. The case for such arrangements is that what would normally be funded by the taxpayer is instead financed by private business, with allegedly a saving as a consequence to the public purse. But a moment’s thought would suggest that this is unlikely to be the case. The cost of financing a project will be the same in principle, wherever the funding comes from. While the initial capital cost, under a PPP, is borne by the private investor, that investor will want to cover the cost of capital and in addition earn a return on capital (or profit) over the lifetime of the scheme –typically, 25 or 30 years. 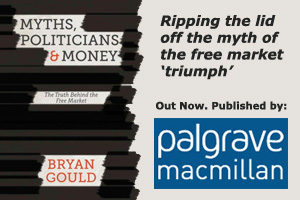 Not surprisingly, in countries like the UK where such schemes were pioneered two or three decades ago, recent impartial research has shown that they often cost the taxpayer more over the whole period than if they were built and funded by more conventional methods. The truth is that the main function of PPPs is to provide, through infrastructure projects, secure and profitable investment opportunities for the government’s friends in the private sector, while ensuring that the greater cost of funding the projects in this way is spread forward over decades to be borne by future taxpayers. But that is only one of the reasons that we should be wary of such arrangements. It is not just the funding that the government would prefer to provide from the private sector. It is also the policy direction of the education we provide to our children that the government wishes to sell to business. This is, in other words, one more instance – though a particularly significant one – of the extent to which the market has now invaded virtually every area of our lives. The view that everything has a market price, and should be traded as though it were a commodity, is now deeply entrenched in our daily lives. How long before prisoners are able to “upgrade” their cells in the new private prisons, as is already being done in some American states? How about buying the right to drive one’s car down a bus lane? We’re getting perilously close to that in Auckland. What about the right to shoot endangered species? You can buy that, too, for the threatened black rhino in South Africa. Buying the right to live in New Zealand? Yes, if you’ve got the money. And how long before pupils at the new charter schools are paid $2 for each book they read –which is what privately run schools in Dallas do to boost performance? If the market makes everything available at the right price, we lose sight of other – perhaps more important – values. But it will suit some people; those with the most purchasing power will be delighted to find that nothing can be denied them.